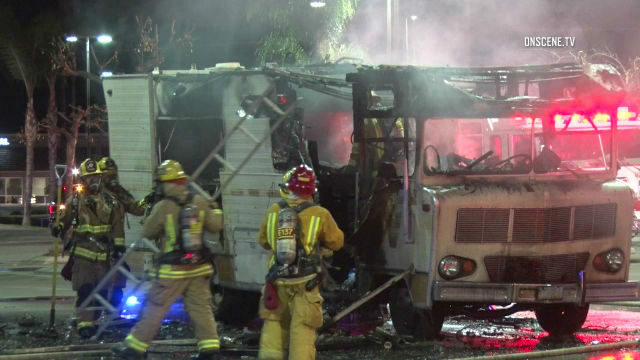 Two men were seriously hurt Friday night then their recreational vehicle caught fire in a parking lot in Escondido. The fire started at approximately 10:30 p.m. in front of the Albertsons at 1509 E. Valley Parkway. Escondido Fire Department paramedics transported both victims, who were believed to be about 50 years old, to Palomar Medical Center. One man was then flown by air ambulance to the regional burn center at UC San Diego Medical Center in Hillcrest. Witnesses said both men were able to leave the burning vehicle before it became fully engulfed in flames.